On our tour of Kansas City, we are also going to head over to SEA LIFE Aquarium. They have all kinds of exhibits about sea life and sea creatures. And while we come from a world class zoo city, we enjoy checking out how other Aquariums present information. We have lots of fun at Aquariums (and manage to sneak in some fun facts while we are there). Our kids can't wait to go exploring and see another shark tunnel. You and your family can also go and enjoy $3 off per ticket. 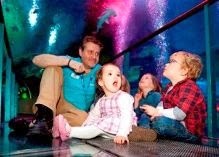 Be sure to print your coupon and head over to the Sea Life Aquarium for loads of fun.